Congrats to comment #69 Cara! Remember right around Christmas time when I reviewing the book I'm Dreaming of a Green Christmas? 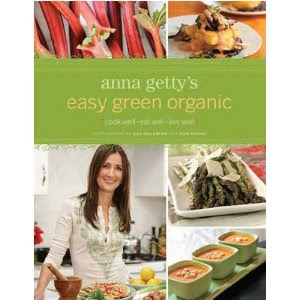 Well, brilliant author and green-mom Anna Getty has done it again. This time, her book 'Easy Green Organic' isn't just about greening up the holidays, its about being green all the time! What I love most about Anna's books is that she seems to come right into your home and speak directly to you. She has this way with her words that softens up and warms even the darkest green hearts. Recipes? Oh yeah, she does not disappoint in that arena either. Let me tempt you with some Quinoa Croquettes with Cilantro Yogurt Cream Sauce. Maybe you would rather serve up some Fried Polenta with Sauteed Wild Mushrooms in a Chipotle Cream Sauce. Is soup your down fall? How about Chunky Tuscan Bean Soup with Swiss Chard and Pancetta? Well, no matter what your food weakness, Anna has you covered. Seeing as though I am pregnant ALL DESSERT calls out to me. I especially love the Pear and Blueberry Crisp with Brown Sugar Sour Cream. Don't let my crazy food brain fool you in to thinking that this book is all about food because it is not. It also has a wonderful array of "did you knows". I love facts and quotes. They are some of my favorite things. Take this fact from Anna's book for example, Did you know that " The US Food and Drug Administration estimates that roughly 20 pounds of pesticides per person are used every year. And of those pesticides, at least 59 are classified as carcinogenic." (cancer-causing) It is not at all surprising to me that the FDA would allow the use of such dangerous pesticides. I mean look at the amounts of chemicals and toxins that are allowed in to your shampoos and lotions. This book is a real eye-opener. It helps you gain knowledge about organic produce and it also helps you learn what choices to make when it comes to eating organic. Eating organic produce is becoming less expensive than it use to be. It is also more readily available. Dr. Alan Greene said once that if you only had to choose two organic foods to eat, make those choices apples and potatoes since they are some of the highest pesticide laden foods. Win It: I would love to bestow a copy of this book onto one of my glorious readers. You will be dazzled, mesmerized and tantalized with each page. I promise. You know you wanna eat it up (pun intended). To win just follow me on GFC and tell me how often you eat organic and one way you try to help the environment. Its that easy. This contest will end on May 29th at NOON EST. Good Luck! It is open to US and Canadian entrants! Thanks for the follow and birthday wishes! Following you back! We don't eat organic as often as I would like, but our baby does lol Once we can start harvesting our veggies we'll be eating organic most of the time. I found your site b/c you're the bast. dfurlong94@yahoo.com I would love this. We don't eat organic nearly enough because we don't have the money always. But we do try and eat healthy. One way we have helped the environment is thru cloth diapering! We love it! Thank you so much for following me and I am following back. Loev your site and can't wait to read more. We don't eat organic very much in the winter but in the summer more. We grow our own vegs with no chemicals of any kind. We help the enviroment by composting, recycling, we plant trees every year and much more. Thanks for stopping by on FF! Looking forward to reading your blog! I try to eat organic foods as much as possible. But to go a step further I try to buy from the farmers market and eat locally harvested food. Have you ever seen Food Inc? It is amazing how much energy and fuel is consumed in getting the produce to the market. Hi! I'm a new follower of your lovely blog on FF. We try to eat organic by planting our own garden so we know what went into the soil. My kids usually eat anything out of the garden which is usally a lot of salad greens. Following you back from Friday Follow! Thanks for stopping by! I just love you blog! Have a good one! I follow you on GFC, eat organic all the time and do many things to save the environment like reusing bags when doing all types of shopping. I believe I initially found your site via Prizey.net. I follow you via Google Friend Connect (Jennifer Mo). I eat organic produce about half the time (mostly in keeping with the 'dirty dozen'). The produce that isn't organic is usually local, at least. To help preserve the planet and lighten my footprint, I eat vegetarian all the time and am flirting with veganism. I found your site through a button on the Wishing Penny blog. I entered your Sula balm giveaway. I entered your EOS lip balm giveaway. I eat organic when I can afford to, as our budget does allow for much. Although this year we will be doing our own garden with all sorts of veggies. I make sure that I recycle everything I can. I don't eat organic anything but then again I don't have a good cookbook :) I would try if I did! I follow via GFC. I eat organic when I can which isn't often enough. A lot of that depends on the season and how readily available local produce is near me. I do much better eating more processed foods like pasta because those items are easy to find year-round. I recycle, have carbon offsets for my vehicle, and buy energy star appliances. We eat organic a lot - in the summer probably 5 days a week. Durring the winter when organic produce can be slim- a bit less. This book looks awesome though- we are vegetarian- so that is one way we help the planet (factory farms are very polluting). I follow you on GFC. We eat organic maybe once week but we are trying to do it more because we know it would help the environment because of the growing practices. I am following you, and I would love to win! We eat organic at every meal, unless it is nearly impossible. That alone is good for the environment, especially with meats. Saves on so much CO2. I found your site from the low entry lowdown. I am now following. We eat organic probably 40% of the time. We help the environment by recycling approx 80% of our waste.